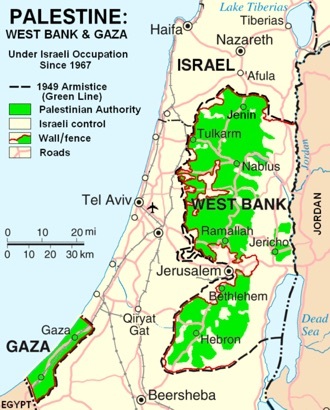 Palestine : When and where to go? Palestine enjoys a mild climate, even in winter, with average temperatures between 9 and 18 ° C, although this season may be rainy and cold in some areas. The summers are dry and hot, especially inland, and temperatures range from 26 to 30 ° C on average. The most enjoyable season to visit the country is spring. Jerusalem is obviously a highly inescapable place: as important for Muslims as for Christians and Jews, the city offers monuments that are the symbols of each of these religions. Wailing Wall, Esplanade of the Temple, Omar Mosque, Al-Aqsa Mosque, Christ's Tomb, Via Dolorosa, so many places full of faith and history. Bethlehem is also a religious center of importance: the birthplace of Jesus for the Christians, and the birthplace of King David of the Jews, and for some there is the cave and basilica of the Nativity, and The tomb of Rachel for the others. The city of Jericho is located on the bank of the Jordan River. Renowned for being one of the oldest cities in the world, it is the site of many excavation sites, and you can admire the Hisham Palace, the synagogue, the Quarantine, the ramparts and the round tower. The remains of several monasteries not far from the city. Other cities to see: Hebron with its old town and its crafts as well as the tomb of the Patriarchs; Nablus with its streets, its stalls and its souk, its factories of soap, of sweets or spices; Ramallah, very lively and full of contrasts, and where stands the mausoleum of Yasser Arafat. Hiking enthusiasts can also rejoice: the Ein Fawwar Reserve in the Wadi Qelt, where spring springs in numbers, is especially worth discovering, hiking footwear. EU citizens do not need a visa but a valid passport 6 months after the return date, as well as a return ticket. The current currency is the shekel. Since the destruction of the international airport of the Gaza Strip, there is no airport in operation to land in Palestine, and in any case the Gaza Strip is forbidden to tourists. To reach Palestine, you will have to pass through Jordan or Ben Gurion Airport in Tel Aviv, Israel. Once there, you will find collective means of transport such as the buses that connect the big cities, and especially the taxis services, which are in fact minibuses (7 places, orange), a little more expensive but liaising With the villages. You can also take a private taxi, or rent a car with or without a driver. On the budget, it is necessary to count at least 25 € for a double room, and around 50 € if you want a little more comfort. You can eat a hearty meal from 7 €, but plan 10 € for something a little more sophisticated. Do not forget the tip, which is not included in the bill! Health: There are no vaccinations required, but it is better to always have standard vaccinations, and add those for hepatitis A and typhoid. Drink only bottled water. Security: Currently highly disadvised to tourists, Palestine is particularly dangerous in the Gaza Strip and border areas with Lebanon, Syria and Egypt. Concerning Jerusalem, it is necessary to avoid public transport and gatherings of crowds. In the West Bank, it is advisable to remain vigilant, particularly in Hebron, Bethlehem, and around checkpoints. If you wish to bring back souvenirs, you will of course find various religious objects (in Bethlehem), but also ceramics (in Hebron), blown glass objects, embroidery, keffieh, soaps (in Nablus), mosaics, spices.